Sieve flour, to it add salt and crushed peppercorns and ghee . Mix well and rub between palms so that it resembles breadcrumbs. Make a hard dough adding just enough water, cover with a damp cloth for at least half hour and keep aside. 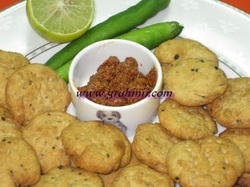 Make small balls out of the dough and make small puris, it should be thick and brittle. Prick them with a fork. 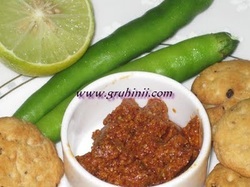 ​Take sufficient oil or ghee in a kadai and fry the mathris till it turns pale golden yellow. It should not fried to dark brown. Remove on paper towels and can be stored for upto 3 months.